The people of Manya Krobo will celebrate this year's week long Ngmayem festival from 26th October to 1st November. The Ngmayem festival is a celebration of the abundant harvest of ngma (millet). It is when the Krobo people, with gratitude and thanksgiving to their maker acknowledge his providence and care over the previous years and supplicate for his continuous bounty and protection in the coming years. The Krobo people (Klo li), in their migration history and particularly after Lolovor, became defined in every aspect of their lives as a people set apart by an invisible pathfinder and sanctifier (Nana Klow3ki) under the Almighty and Creator (Mau) of all things. From one area to another they became moulded, newly shaped and polished. They stepped out from the suspicious into a new way of life; from tired wandering into rest by great and brave leaders. This new life meant accepting a new economic and political system of leadership and a new culture of Christian religion under the great King Odonkor Azu (1835-1867), who started the Krobo Nation's dynasty and kingship. He was followed by other brave and wise kings; King Sakite I (1867-1892), Nene Sir Emmanuel Mate Kole (1892-1939), Nene Azzu Mate Kole (1939-1990) and Nene Sakite II (1997 -to date), all of who have progressed the unification of Klo li under a new culture, which fits them with others as people of the nation of Ghana. The will to exist and survive, which gave birth to the characteristic wily defense strategies gave way, in peace time, to various modifications in the life of Krobos. Since 1845, the system changed into an economic, political and military leadership under King Odonkor Azu. The new philosophy underpinning these new arrangements was agricultural development with palm tree cultivation as its driving force. Throughout the year, with backs bent under the scorching sun, equipped only with the cutlass and hoe and at the mercy of unstable weather, the hardworking, dedicated and industrious Krobo farmers proved equal to the tasks of their new world. Such continuous hard work under difficult conditions was bound to take its toll on the health of Klo li and their economy. Rest is indeed a great doctor whose consultation period is towards the end of the year; the time of reward for the years' agricultural activity, which on the Krobo calendar stretches from the end of October to the end of December. This is when the farmer and his family can afford some rest, there being enough stored in his barn. There are also numerous cultural and social activities to attend to; marriage ceremonies, funerals pushed forward until a convenient time, settlement of family matters and the general re-union of long-gone family members whose work may have sent them far beyond the borders of Krobo. The element of re-union is an important one, which brings the youth born outside Krobo to climb onto the knees of grandsires and exchange smiles and affection in a cultural unity. Agriculture is the principal occupation of the Krobo. The seasons of sowing and reaping are regulated by the phases of the moon and general weather patterns. Our people have from our very beginning deduced a religious significance and applied its sanctity to the activities of tilling the land. The Koda Festival, which is twenty weeks before Ngmayem is a time for preparation when all wrongs are corrected before the offer of our national thanksgiving. Additionally, in this era devoid of tribal wars, the old Nadu fetish dance has given way and been subsumed into the Ngmayem festivities as the new way of rendering thanks to God for divine protection and providence. The Ngmayem festival in its modern form was formally instituted by Nene Azu Mate Kole in 1944 to encapsulate all these values and events, and continues to be celebrated in style to date. The weeklong is as follows: Monday 26th October - Yokama (Ideal Woman's Day) and Djebiami Reunion. On Tuesday 27th October, - 'S3 Peemi' (Purification of the Paramount Stool), Manya Reunion, Piengwa Reunion and a Gospel Rock Show in the evening. Wednesday 28th October - Akl3m3 (Visit to the Royal Mausoleum). Thursday 29th October - Kloyom (Visit to Klo Ancestral Home in the Klo mountains) and paragliding, cooking competition and Suisi, Akwenor and dorm reunions. Friday 30th October - Guami yam (Grand durbar of chiefs, queen mothers, invited guests and the people of Manya Klo at Oklemekuku Park, Laasi). Saturday 31st October - Miss Ngmayem Pageant and the crowning of Miss Ngmayem. Sunday, 1st November - Non-denominational service at the Oklemekuku Park at Laasi. 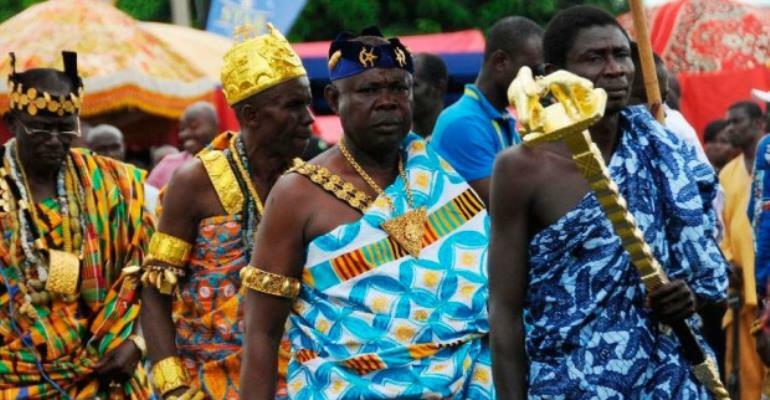 The celebrations will be rounded up by a durbar of the chiefs and people of Manya Krobo, a non-denominational thanksgiving service and a final farewell to Kloli by their chiefs and queens to go refreshed and come back blessed. OKLIBONI!